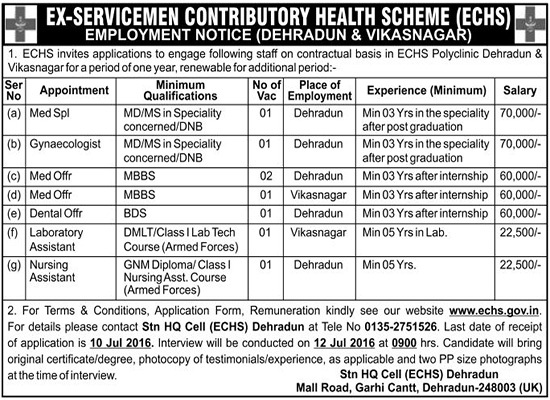 ECHS (Ex-Servicemen Contributory Health Scheme) Polyclinic Dehradun has released the advertisement for the recruitment of Medical Specialist, Medical Officer, Laboratory Assistant, Clerk & Driver on contract basis for the duration of One Year. Interested candidates may apply on before 22-09-2016. Interested candidates can send completely filled application form till 22-09-2016 at below mentioned address. 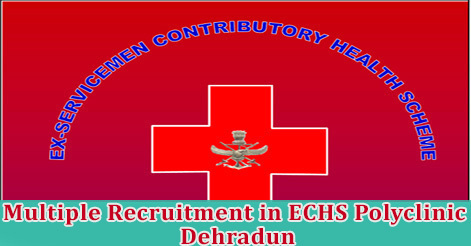 The desirous candidates can check the official website www.echs.gov.in for details. One can also contact to Stn HQ (ECHS cell) Dehradun. 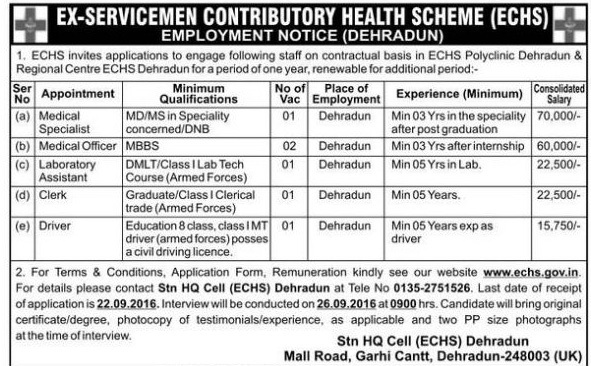 Help us to improve this article/job posting "Doctors, Clerk, Driver & Lab Assistant Recruitment ECHS Polyclinic Dehradun". We would be glad if you can comment below and provide your valuable suggestions and feedback. If this page have any wrong information/list or out of context content, then you can report us as well. Sir I have done my b.pharma in sgrrits Dehradun and I am from rudrapryag .i have done bbharama recently 2015. Can I apply for pharmacy in your polyclinic. sir i will apply in data operator . i am work in i c d sto the post of data oprator. Experience nhi hai can I apply ? 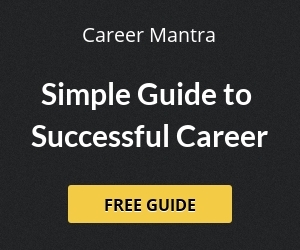 sir I am qualified DOT and BHMS doctor I have a job opportunities with u please sir,can u give me a chance..? Till 12th July applicant’s have to reach? I’m a pediatrician practising in Kolkata,and Associate Professor in Institute of Child Health,Kolkata. Is there any provision to join?